After two weeks of work at its archaeological concession on the Abusir pyramid field, the current expedition of the Czech Institute of Egyptology (CUFA) discovered a unique burial complex of the royal confidant and priest Kaires. The tomb is located at the heart of the pyramid field from the 25th and 24th centuries BC, i.e. the reign of the 5th Dynasty of the Egyptian Old Kingdom, in an area where only members of the royal family and the highest state dignitaries of the time were buried. The complex of Kaires’s tomb extends over an area of more than 500 m2, and apart from the tomb itself contains several other rooms which served for the funerary cult and the ritual purification of the priests before they could enter the tomb. The cult chapel represents an architectural feat, completely unique in the context of the entire 3rd millennium BC, as it was paved with basalt blocks. The use of basalt was an exclusive privilege reserved for kings and its presence here is one of several pieces of evidence of Kaires‘ exceptional status. Unfortunately, only a few pieces of the cultic stela with the owner’s titles, the so-called false door, have been preserved to present times. Kaires‘ burial chamber was looted already in the antiquity, but in front of the limestone sarcophagus, his granite statue with remnants of colouring and further titles has been rather miraculously preserved in its original location. The discovery of this statue presents the answer to a long-term discussion: whether ancient Egyptians placed statues into burial chambers. It proves that they did indeed. Kaires was the sole friend of the king, overseer of all the king’s works, keeper of the secret of the Morning House, steward of the royal palace, foremost of the House of Life, inspector of the priests serving in the pyramid complexes of kings Sahure and Neferirkare, priest of the goddess Hathor, mistress of the sycamore, in Cusae (a city in southern Egypt), custodian of the two thrones (i.e. of southern and northern Egypt), and he held several other titles. These titles indicate Kaires’ exceptional career.The Morning House was a specific location where the king would come in the morning to eat breakfast and get dressed, whereas the House of Life was an institution where Egyptians stored texts recorded on papyrus scrolls containing their knowledge and religious and philosophical treatises. Another unique trait of the tomb is the construction of the burial chamber which was built in an open pit. After the sarcophagus had been lowered and the side walls lined with limestone blocks, the chamber was closed by several giant ceiling blocks of limestone, each of which weighs at least 8–9 tons. Even though the expedition is still running and the final analysis of all the data and information collected will take much longer, it can be said even at this stage that this is a unique discovery of a tomb of an exceptional figure of Egyptian history in the 3rd millennium BC. Kaires’ titles place him at the level of the viziers (prime ministers) of the time, whereas the architecture of his tomb completely exceeds the customs of the time and the full appraisal of this fact will only be possible after further investigation. 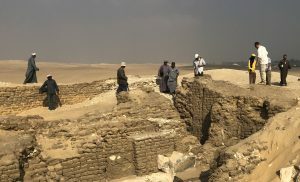 The excavation works have been proceeding in close cooperation with the Ministry of Antiquities of the Arab Republic of Egypt and the Inspectorate of Antiquities in Saqqara.